Spanish tapas, those delicious small tidbits, are a delicacy. There are many recipes from different regions in Spain. Below you'll find some of my favorites. I'm very fond of vegetable dishes, as you may see from the selections I have made. Why not copy the Spaniards - "Vamos a picar algo" - let's nibble something! The dishes are placed, one or a few at the time in the center of the table. The guests are provided with forks and a piece of bread, you pick (picar) with your fork and use the bread to soak up the liquid, often with a wonderful taste of olive oil and garlic. la Mancha. A delicacy on the tapas table! The recipes below serves 4, the quantity depends on how many different tapas you make. The sensation is a bit like a Swedish "smorgasbord". Everyone who has tried it knows that the stomach normally fills up faster then the eye does. Serve with Spanish red vine, a cool beer or chilled dry sherry. "¡Que aproveche!" Have a nice meal! Do you have some nice recipes that are missing here? Please mail me. "La tapa" so as to be considered, has to be eaten between main meals as food that allows the body to hold until lunch or dinnertime." The Spaniards are not known for eating a solid breakfast. Normally they enter a bar around 11 AM for a tapa or two to be able to survive until the main meal - la comida. (Lunch). The following history description is a short summary from an excellent site, World of tapas (in English and Spanish). 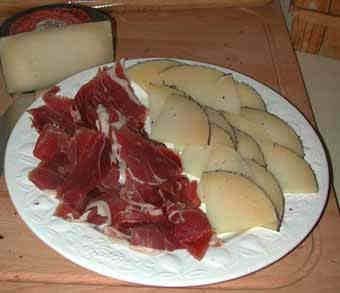 Some authors assure that "the tapa" was born due to an illness, when the Spanish king Alfonso the 10th, the Wise, had to take small bites of food with some wine between meals. Once recovered from the disease, the wise king ordered that in all inns of Castile's land could not serve wine it it wasn't served with something to eat. This royal providence had to be considered convenient and wise in order to avoid the alcoholic disturbances in the body to the ones that drunk the wine, those that, hadn't enough money to pay for a regular meal. Once the "tabernas" (taverns) were all around Spain, the wise King demand continued being effective. And for that reason, the glass or jar of wine served was covered with a slice of either smoked ham or cheese. It had two aims: first to avoid that insects or other impurities could fall into that jar and then for the guests to soak the alcohol they drunk with something solid, like King Alfonso had advised. That was the origin of "la tapa", a solid food that covered the wineglass. And so this tapa tradition was spread out all around Spain, even nowadays, and it has been adopted or disguised in other countries.